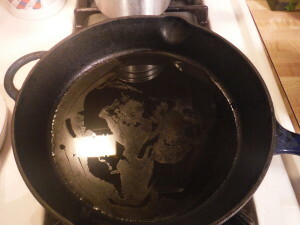 I used a cast-iron skillet but I’m sure you could substitute another type of pan. Just be sure that it is oven proof! Additionally, I just whipped this up so there is no specific rhyme or reason to the method. Change it as you will! 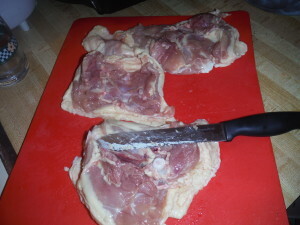 Let’s get to it: Gather your ingredients: 4 bone-in chicken thighs (be sure to get bone-in because it has that nice flap of skin on it. You can also use boneless chicken thighs if you like, but I’ve never seen them with skin), cooking fat of choice (I have butter and coconut oil pictured, but I ultimately went with rendered bacon fat), and spices of your choice. I used granulated garlic, onion powder, sea salt, and pepper. 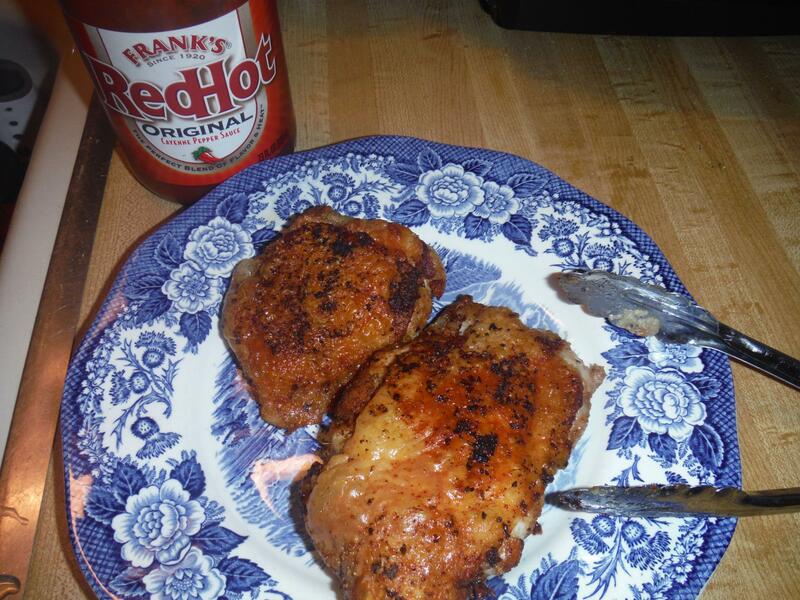 If you like it hot, spice it up with some paprika or cayenne pepper. 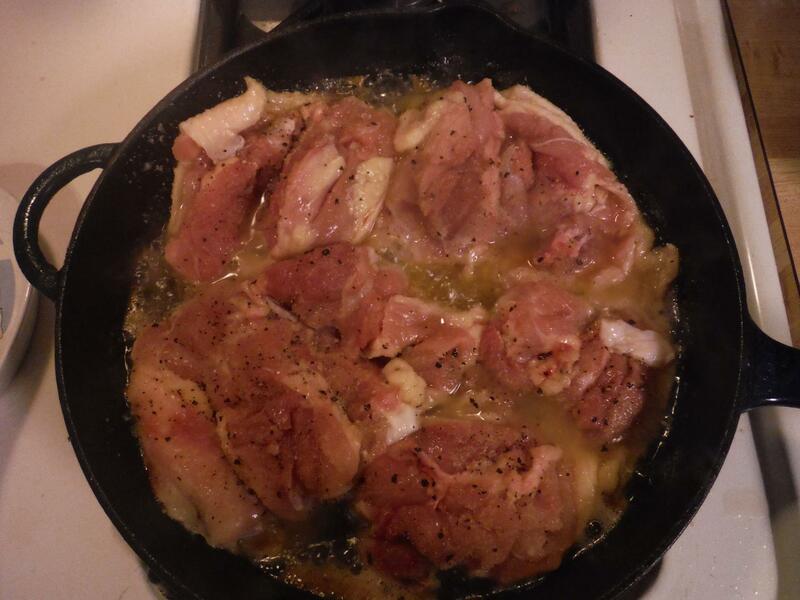 First, de-bone your chicken. Don’t let it intimidate you, it’s easier than it sounds. I used to hate de-boning chicken because I thought it scary. You can’t see the bones, the cuts aren’t always clean, etc. – but it’s not bad once you’ve done it once or twice. If it makes you feel better, find an instructional video on youtube. That’s what I did 😉 Now liberally season with the spices of your choice. Don’t forget the other side! Melt your fat of choice in a cast iron skillet over medium-high heat. Preheat the oven to 350F. 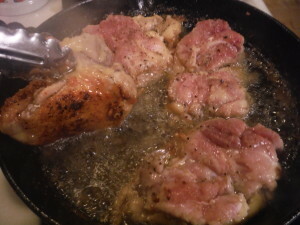 Once the oil is melted, add the chicken skin side down. 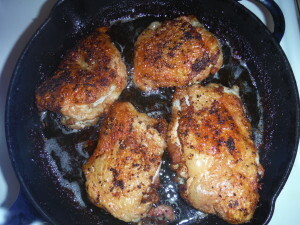 Let them cook for about 5-6 minutes, depending on the size of your thighs, and move them around the pan to ensure even cooking. You know there’s always a sad side of the pan where nothing cooks as well. 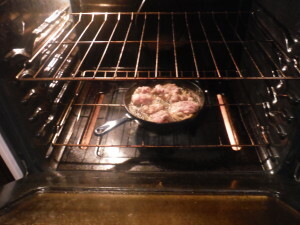 Cook for 5-6 more minutes. Using tongs, check the color of the skin. 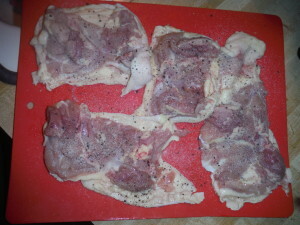 When it looks like this, it’s ready for the oven. Let the chicken bake in the oven for about 10-12 minutes. 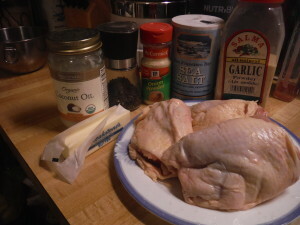 Our goal is to cook the chicken through while still crisping the skin. 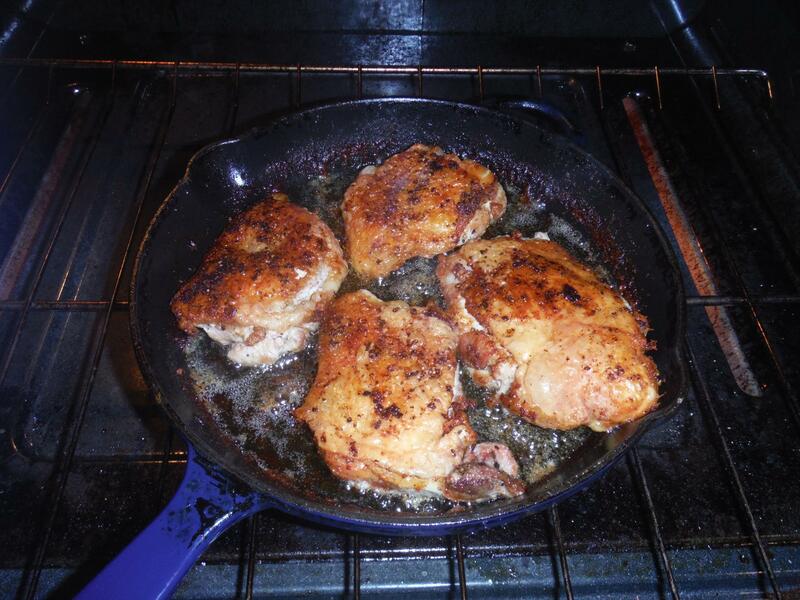 At the 10-12 minute mark, flip the chicken over and cook for 8-10 more minutes. And here is the beautiful result. Crisy fried chicken, hot out of the oil. Mmmmmmm. Be smart and let them cool or you will burn yourself on the hot oil attempting to sample a piece of the beautifully crunchy skin. PATIENCE! I, clearly, have none. 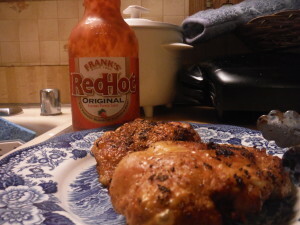 Serve hot with some Frank’s RedHot. Saving some for later? These refrigerate and travel well. 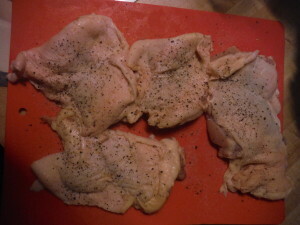 The skin stays slightly crispy, even when microwaved. I hope you try this soon and enjoy it! I know you will!